The 400m hurdles is one of the most grueling track & field events. The [wo]man-killer event tests the limits of one’s speed endurance. Intermediate hurdlers are known for digging deep. A couple of Russian women are perched on top of the 2012 rankings. The 2011 World Championships silver medalist, Natalya Antyukh Наталь Антюх, ran a world-leading time of 53.40s at the Russian Championships in Chekosbary in early July. Her younger compatriot, the newly minted European Champion Irina Davydova, is second with 53.77s. 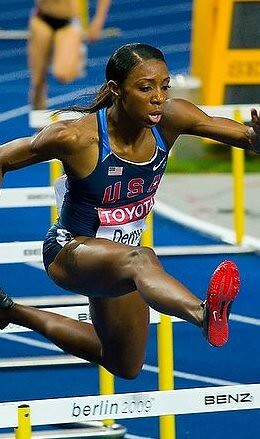 The reigning World Champion, Lashinda Demus (53.98s), trails Davydova in the 2012 tally. Vania Stambolova Ваня Стамболова (54.04s), Denisa Rosolová (54.24s), Georgeanne Moline (54.33s), and Hanna Yaroshchuk Ганна Ярощук (54.35s) round up the next four. The defending champion from Beijing, Melaine Walker, has a season’s best of just 54.62s – a far cry from her personal best of 52.42s personal best from the 2009 World Championships. On paper, the Russian duo hold the edge over the rest of the field. However, the list of protoganists in the 400m hurdles is a classy bunch, with three sub-53 second athletes. Jamaica’s Walker (52.42s) is the second fastest of all-time. Demus (52.47s), the American record holder, is third thanks to her gutsy run at the Daegu World Championships. 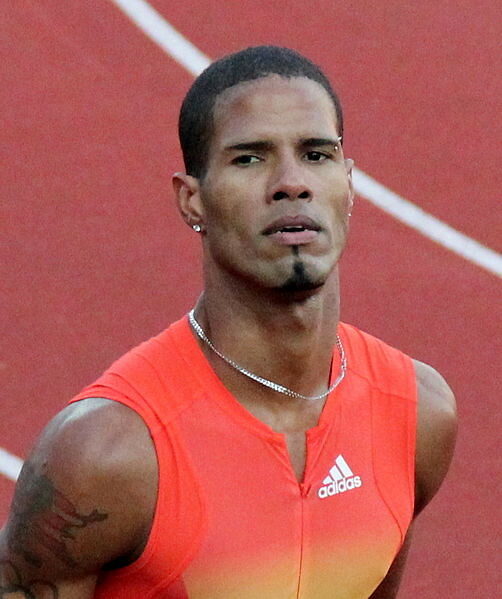 Antyukh, a multiple World and Olympic medalist, has a lifetime’s best of 52.92s from the 2010 Barcelona European Championships. Depending on the conditions, perhaps a mid-52 second clocking is needed to secure Olympic gold in London. It could go both ways, between Demus and Walker. As reigning World and Olympic Champions, respectively, these two are the obvious favorites. Demus might just have the psychological momentum, due to the recency of her feat. The battle for third will be fought primarily between Antyukh and Davydova, with the quartet of Stambolova, Rosolova, Moline, and Yaroshchuk lurking to play spoil sport. The dark horse could be Rosolova. She specialized in the 400m dash for a couple of years prior to her shift to the intermediate hurdlers. She won the 2011 European Indoor title and has an outdoor personal best of 50.84s. Rosolova is the greenest among the lineup, however, with only six or seven outings in the 400m hurdles. The United States has won 17 out of the past 24 Olympic Games, making a full sweep of the medals five times. The most recent sweep was in Beijing, where Angelo Taylor, Bershawn Jackson and Kerron Clement lorded it over the competition. Since the 1984 Los Angeles Olympics, the U.S. have fallen short of the gold only once – in Athens, to a certain American-born Dominican named Felix Sanchez. The 2012 event has a more multinational flavor, with Puerto Rican Javier Culson (47.78s) and Briton David Greene (47.84s) occupying the top two spots in the season top list. Bershawn Jackson is third fastest with 48.20s. The Batman, however, will not compete in his best event in London since he only placed fourth at the U.S. Olympic Trials. Michael Tinsley and Takayuki Kishimoto 岸本　鷹幸, both making their respective Olympic debuts, trail Jackson. The resurgent Sanchez has a season’s best of 48.56s, set in the same Paris Diamond League race where Culson ran his world lead. 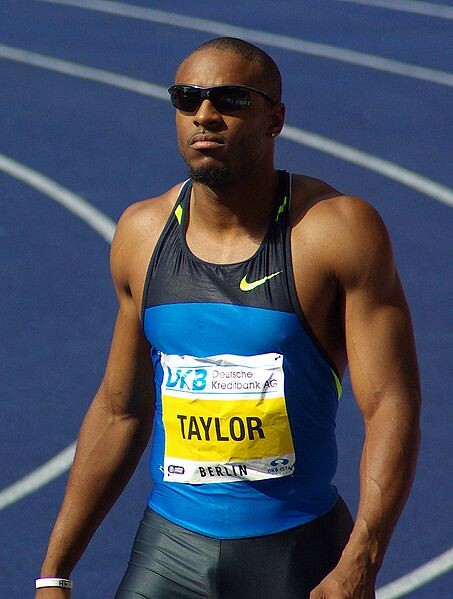 Angelo Taylor, the Olympic Champion from 2000 and 2008, is one-hundredth of a second behind Sanchez. Last season was not exactly a banner year for the intermediate hurdles. Despite L.J. 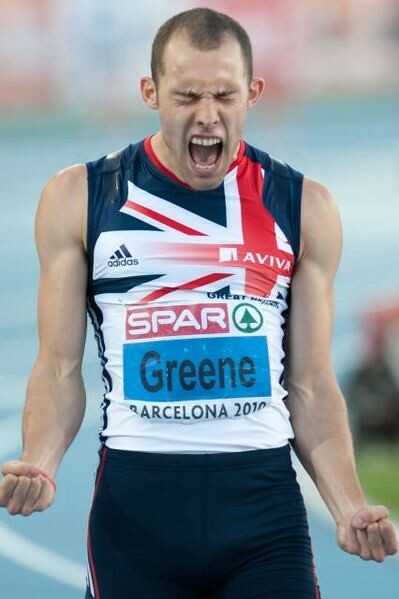 Van Zyl’s spectacular mid-47 clockings in South Africa, Greene needed just 48.26s to wrest the World title in Daegu. With just two athletes below 48 seconds this season, the prospect of faster times does not seem any brighter. 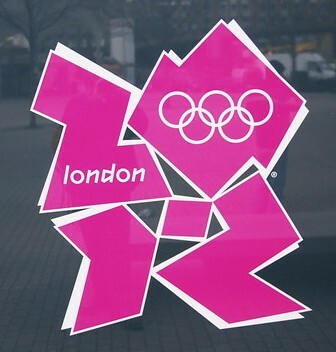 But then again, one could not discount the lure of the Olympic Games. As they say, the Olympics bring out the best in athletes. The Olympic final could feature the champions from Sydney (Taylor), Athens (Sanchez) and Beijing (Taylor, again), going head-to-head with the World Champions from Berlin (Clement) and Daegu (Greene). Clement (47.24s, 2005), Taylor (47.25s, 2008), and Sanchez (47.25s, 2003) are one of the fastest hurdlers in history. Culson is the top bet, thanks to his above-par performances in 2012. Greene, despite undergoing a knee surgery last December, seems to be back in tip-top shape after setting a lifetime best behind Culson in Paris early this July. I’ve always been a big fan of Sanchez. The way he fought through the pain of injury to defend his World title at the 2005 Helsinki World Championships embodied the resolve needed to win such a grueling event. I’d love to see the respected Dominican win another Olympic medal. Taylor, despite his seeming inability to excel in the World Championships, is a proven Olympic performer. Greene and Culson might be the statistical favorites for Olympic Gold, but one cannot discount the huge experience of the event’s elder statesmen (Taylor only had a season’s best of 48.42s coming into the Beijing Olympics, but he still ran 47.25s in the final!). The so-called old guys might spring a surprise. Lauren Boden is this week’s track beauty! In the post-Jana Pittman years, Boden is Australia’s best bet in the women’s 400m hurdles. Lauren is a six-time Australian champion, a title which she first won back in 2005 as a teenager. That same year, Boden went on to compete at the World Youth Championships in Marrakech, where she won silver (58.30s), on top of her 10th (5.98m) place in the long jump. Boden ran a bit better at the World Junior Championships in Beijing the next year (58.05s), but crashed out at the semifinals. 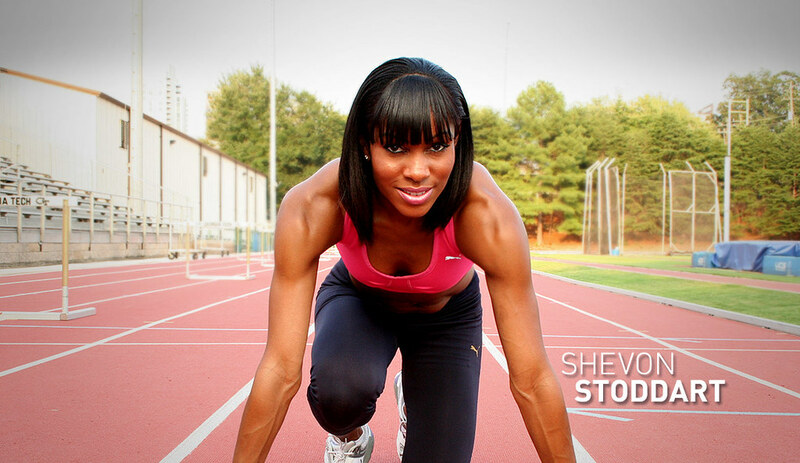 Shevon Stoddart is this week’s track beauty! The Jamaican is a world-class intermediate hurdler. She has a personal best of 54.47s in the 400m low hurdles and 52.89s in the 400 flat. 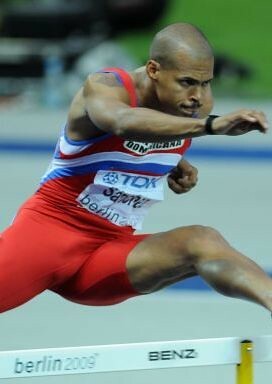 Stoddart has competed in two Olympic Games, in Athens and Beijing. At the 2005 Helsinki World Championships, she went as far as the semi-finals for her best ever performance at a major international. The University of South Carolina alumna also placed fifth at the 2006 Commonwealth Games in Melbourne, on top of her bronze medal from the 2005 Central American and Caribbean Championships. Stoddart is a woman of many talents. Aside from her proclivity to speed, Shevon is recording artist, a song writer and a designer as well. Wenda Theron is this week’s track beauty! As a youngster, Theron started out as a short sprinter, attempting the 100m-200m double at the 2006 World Junior Championships in Beijing. She displayed much potential as a youth athlete, reaching all the way to the 200m dash semifinals of the 2005 World Youth Championships in Marrakech. A cursory look at her personal bests (100m dash – 11.88s, 200m dash – 24.20s, 400m dash – 53.93s) indicate her sprinting talent. The South African 400m hurdler competed at the Daegu World Championships back in August of this year. The 23-year old ran a superb race in qualifying, stopping the clock in a new personal best time of 56.13s. At the semifinals, however, Theron failed to replicate her performance, finishing in eight place (57.06s). She improved considerably from her 56.76s clocking at the Shenzen Universiade finals, held a few days before Daegu. Although the University of Pretoria graduate has yet to land a major international medal, Theron has distinguished herself in continental competition, qualifying in the top eight at the competitive African Championships in 2010 and winning a silver medal at the 2011 All-Africa Games. Theron qualified for an outright slot for the London Olympics during the South African Open Championships in Pretoria held last May. She bettered the “A” standard of 55.50s as she ran 55.36s in qualifying. South Africa has a knack for producing world-class intermediate hurdlers like L.J. Van Zyl and Cornel Fredericks. With such high quality compatriots sharing the same discipline, it won’t be surprising to find Theron amongst the world’s elite in a few years’ time. The 400m hurdles – Indoor! I was about to sleep at the wee hours of Sunday morning, when I read tweets from the Aviva Grand Prix in Birmingham. 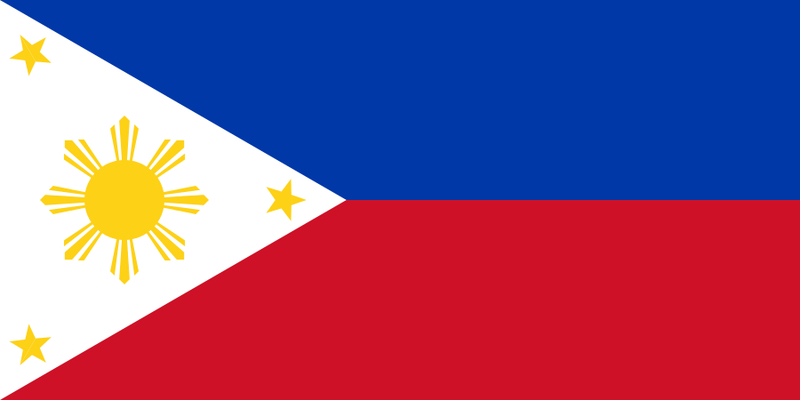 I read about 2004 Athens Olympic champion Felix Sanchez winning a 400m hurdles race – INDOORS! Other tweets mentioned something about the athletes being allowed to cut to the first lane after lap one. This, naturally, piqued my interest. A Google search led me to several informative articles. It turned out that such a race originated in France. The innovative 400m indoor races are held in various races in continental Europe. The Birmingham meet was the first time such a race was held in British soil. To date, the event hasn’t been added to the major indoor meets. I can understand the reticence. The cardinal rule for hurdling is to stay in your own lane. Although one tends to hit an opponent with one’s arms in the high’s, or in more drastic situations veer into another’s designated lane, lane invasion is a major no-no. I found a one-year clip of a race in France featuring Sanchez. El Superman, as former world champion and Olympic champion, is the biggest name who has competed in the indoor intermediates. It was an exciting race to say the least! Hurdlers chasing down other hurdlers without segregated lanes is a refreshing sight for spectators – a scary spectacle for sprint hurdlers like myself! In the outdoor 400m hurdle race, hurdlers typically follow a 15 step pattern in between barriers (13 for the elite, 17 for non-elite). 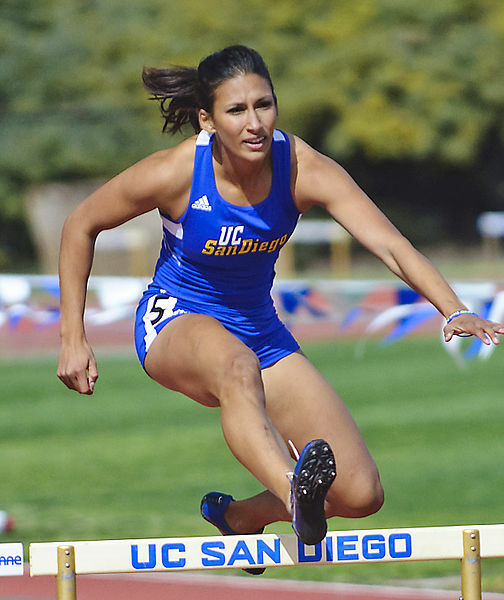 Since fatigue is a major factor, most intermediate hurdlers shift lead legs in the course of the race; hence, taking 14 or 16 steps in some phases. In the indoor race, it takes 10-11 steps in between the barriers. After which, the athlete runs immediately on the curve, which takes about 25-26 steps. The finish line greets the hurdler shortly after the 8th and final barrier. The fundamental tenets of hurdling remain – athletes cannot touch or go under the hurdle. But since the second lap entails an inner lane free-for-all, hurdlers observe some basic ground rules. For instance, when two athletes are running head-to-head (with but half a step separating both), the leader clears the barrier on lane 1, whilst the trailing athlete clears the hurdle in lane 2 and so on. Wacthing the clip of the landmark Aviva race, I couldn’t help but gasp at the pure excitement of it all. Sanchez sped to the lead early on, easily making up for the stagger. The 2003 Paris World Champion overtook Britain’s Richard Yates by the 120m mark. The exuberant Yates, matched Sanchez stride-per-stride. Yates swerved to the inner lane the earliest, grabbing the lead in the process. In the final 100m, Yates, Sanchez and Reuben McCoy were engaged in a mad dash to the tape. Sanchez ran like a man possessed, as if it was an Olympic final, not wanting to yield to Yates. The US-born Dominican hit the last two hurdles and literally stumbled to the finish line. Being the true showman that he is, Sanchez bowed to audience as soon as he recovered his bearing. The Athens Olympic champion stopped the clock in 49.76s (three hundredths of a second off Sanchez’ world best). McCoy was second in 49.78s whilst Yates clung on for a 50.21s UK record.